Please visit our Open House at 853 20TH AVE E in Vancouver. FRASER STREET. This is a delightful family home. It has two bedroom on the main floor, living, dining and family Room with fireplace. There is a bright kitchen with breakfast bar and a nice one bedroom suite. A Big Deck, perfect for BBQ's and a covered front porch to sit out and watch the neighborhood. Updated including roof, hot water tank and furnace and in move-in condition. Walk to Glen Park, Dickens Annex and pop into Earnest Ice Cream for a Summer Treat. Conveniently located to shopping and restaurants with Easy access to Main Street and Downtown. School catchments: Dickens, Dickens Annex and Tupper. YOU'LL LOVE IT! I have listed a new property at 214 2320 40TH AVE W in Vancouver. Manor Gardens. Two bedroom and den could be three bedroom, two bath, large apartment in the heart of Kerrisdale! Private and Quiet with light on three sides. This is an end unit in the building. Updated kitchen and bathrooms, engineered cherry wood floors and gas fireplace. Big wrap around balcony on the South side. Spacious rooms and a great layout. A short walk to restaurants, coffee shops, shopping, transit, community centre and all that you love about the Westside. Two storage lockers, one parking space and a pet friendly building. The building has a large roof top deck and has been replumbed. YOU'LL LOVE IT! I have listed a new property at 853 20TH AVE E in Vancouver. Please visit our Open House at 214 2320 40TH AVE W in Vancouver. I have sold a property at 409 298 11TH AVE E in Vancouver. Sensational views of Vancouver's skyline and mountains to soak up from almost every room in this fabulous suite. Clean lines, floor to ceiling windows, open layout, corner suite with wrap around deck, made for enjoying! Kitchen with granite counters, gas cooktop, centre island and dining area by city lights and fireplace! Noteworthy 2 parking spaces, plus a storage locker, in suite laundry. The Sophia, concrete building, is perfectly situated in the heart of vibrant Main/Mount Pleasant neighborhood. Pets & rentals welcome. Building has lounge, playground and huge bike room. This is as good as it gets! I have sold a property at 65 40TH AVE E in Vancouver. WEST OF MAIN. On a beautiful tree lined street, this charming, well cared for home has been completely renovated. Two bedrooms on the main, a formal dining room, living room and another bedroom or office downstairs for you. There is a great one bedroom suite. Updated kitchen, bathrooms, plumbing, electrical, heating, landscaping... the list goes on. There are refinished oak hardwood floors, gourmet kitchen with stainless steel gas stove, wood blinds, top of the line washer and dryer, security system, parking for 3 cars (one car garage) - all packaged within a beautifully landscaped yard with in-ground sprinkler system and a new fence. Easy to Oakridge Mall, The Canada Line to downtown, great parks and schools. YOU'LL LOVE IT! I have sold a property at 64 44TH AVE W in Vancouver. SUPER FAMILY HOME. This is a SIX bedroom, FOUR bath plus TWO bedroom ONE bath LANEWAY house. Located on a quiet street lined with blossoming cherry trees. Totally renovated in 2011. New kitchen, bathrooms, flooring and fixtures throughout. The large bright Kitchen has Granite countertops all stainless steel appliances and an eating area spilling out through double doors to the new covered deck. Upstairs is the master suite with Spa bathroom, two more bedrooms and a great family room with vaulted ceilings and lots of windows. A generous 41x124.25 foot lot, South facing, fully fenced backyard. Alarm with Video system, Built in Vacuum. Laneway built in 2011 can be purchased furnished for AirBnB rental currently averaging $2500/3000 per month. The basement could be converted to an additional suite. Close to Oakridge Mall, Great Schools, Parks, The Canada Line, YVR and Downtown. YOU’LL LOVE IT! VANCOUVER, B.C. 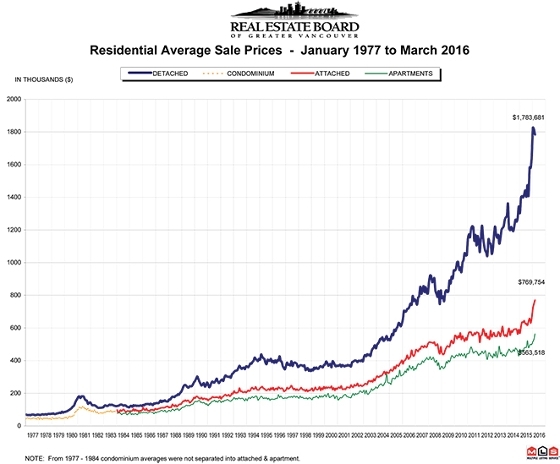 – April 4, 2016 –Metro Vancouver* home sales eclipsed 5,000 in March for the first time on record. Residential property sales in the region totalled 5,173 in March 2016, an increase of 27.4 percent from the 4,060 sales recorded in March 2015 and an increase of 24 per cent compared to February 2016 when 4,172 homes sold. Last month’s sales were 56 percent above the 10-year sales average for the month. "March was the highest selling month the REBGV has ever recorded,” Dan Morrison, REBGV president said. “Today's demand is broad based. Home buyers are active in neighbourhoods across our region." New listings for detached, attached and apartment properties in Metro Vancouver totalled 6,278 in March 2016. This represents an increase of 5.2 percent compared to the 5,968 units listed in March 2015 and an 8 percent increase compared to February 2016 when 5,812 properties werelisted. The total number of properties currently listed for sale on the MLS® system in Metro Vancouver is 7,358, a 40.5 percent decline compared to March 2015 (12,376) and a 0.8 percent increase compared to February 2016 (7,299). “Strong job and economic growth in our province, positive net migration and low interest rates are helping to drive this activity," Morrison said. The MLS® Home Price Index composite benchmark price for all residential properties in Metro Vancouver is currently $815,000. This represents a 23.2 percent increase compared to March 2015. Sales of detached properties in March 2016 reached 2,135, an increase of 24.8 percent from the 1,711 detached sales recorded in March 2015. The benchmark price for detached properties increased 27.4 percent from March 2015 to $1,342,500. Sales of apartment properties reached 2,252 in March 2016, an increase of 38.4 percent compared to the 1,627 sales in March 2015.The benchmark price of an apartment property increased 18.8 percent from March 2015 to $462,800. Attached property sales in March 2016 totalled 786, an increase of 8.9 percent compared to the 722 sales in March 2015. The benchmark price of an attached unit increased 20.1 percent from March 2015 to $589,100. Please visit our Open House at 64 44TH AVE W in Vancouver. Please visit our Open House at 65 40TH AVE E in Vancouver.